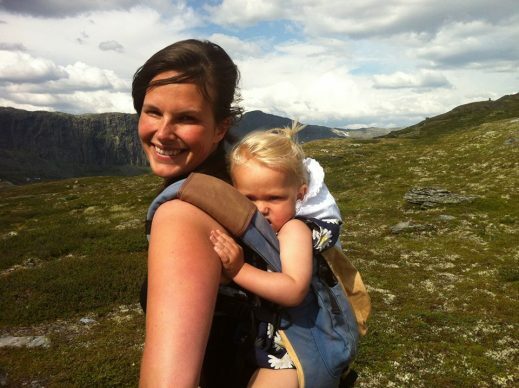 Eline Strand-Amundsen is a life-long member of the Church from Oslo, Norway. 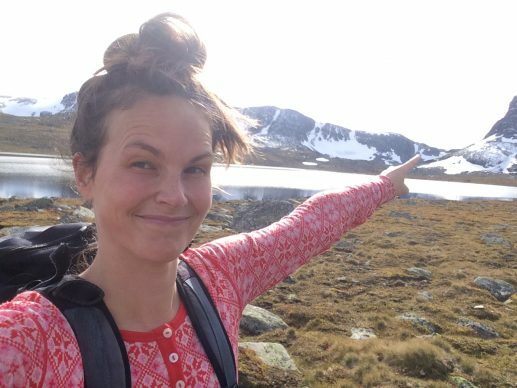 Raised in a family committed to the Church, Eline grew up with the gospel as a central part of her life, the lens through which she saw the world. 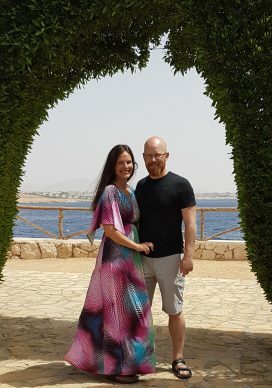 She married in the temple, but six years into their marriage her husband Runar lost his faith in the Church. While he supported Eline and their children in continuing church activity, Eline found herself struggling with her own newfound doubts along with the burden of guiding her children’s religious lives by herself. 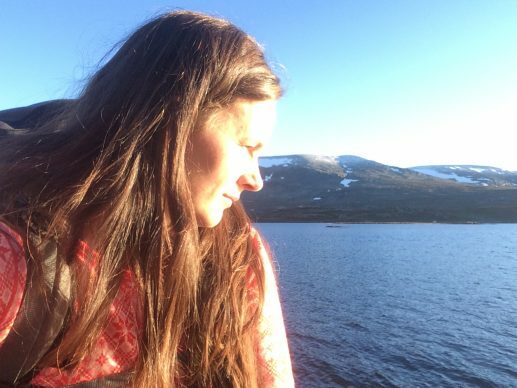 She sought answers and encouragement through prayer, scripture, fasting, temple attendance, counseling with loved ones, time in the mountains, and editing her blog Mormonkvinner (featuring interviews with Norwegian Mormon women, now called Et Vindu). 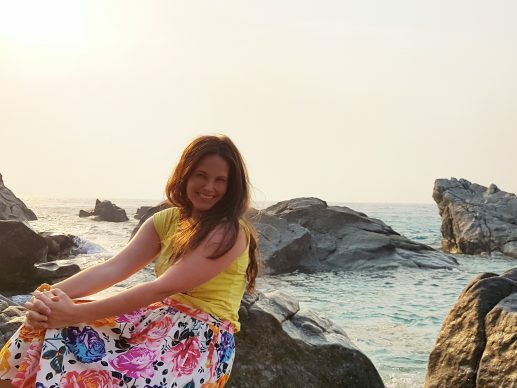 Her journey over many “waves” of doubt altered the lens through which she views the Church and the world, but she has new confidence in her faith and in her knowledge of God’s love. This interview is part of our Mixed-Faith Marriage Series. What was it like growing up as a member of the Church Norway? I have been an active member of the Church my whole life. My family and my in-laws are all, with a few exceptions, active members with tremendous faith. The gospel has always been a natural part of my life. I was the only Mormon at primary school, high school, and university. It was not a problem; I had great and respectful friends. I didn’t have to defend my faith or fight for it. No one really cared! None of my friends were religious and the LDS faith wasn’t anything I promoted. Faith is very personal in Norway and in Scandinavia. I went to church every Sunday, 20 minutes by car to get there. We had maybe ten girls in Young Women and activities on Fridays, and about 250 people at sacrament meeting. My dad has been a bishop and is now the stake patriarch (two stakes in Norway). My mom is the sunday school teacher for adults. She has had almost every calling a woman can have. 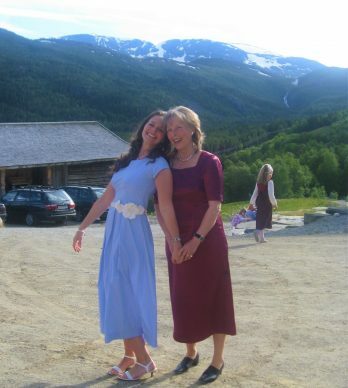 She has been active in public affairs for the Oslo Stake, and has written and directed plays at church. So my parents are mega active and enthusiastic. The Church, and the gospel, and my faith were simply the looking glass through which I saw the world. I know who I was and what I wanted. My faith gave me comfort and self-confidence. But on the other hand, I never liked being different. Going to a party and being the only one not drinking wasn’t fun. But I put on a smile and pretended I didn’t care, even though I did. I hated being “the boring girl” because I don’t relate to that! I love having fun, dancing, playing, laughing. I was never treated differently; it was all in my head. I’m still working on that—”being myself” when I feel different. I met him at a youth activity in church. Initially I didn’t really want to go to the activity, thinking it would be boring and “nothing new.” But I went. I was in the kitchen to grab some food when a guy came in. I had never seen him before—who was this handsome dude?! I was excited, so I went up to him and introduced myself! “Hi I am Eline, who are you?” I can’t believe I did that! On the other hand, this was Runar’s first church activity in years. He didn’t want to go either, but said yes to an invitation from a friend. So here we met for the first time, two youth in their twenties, wanting to be somewhere else. It must be faith! 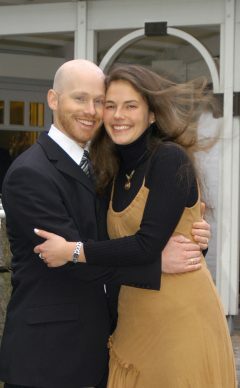 Eline and Runar, around the time of their marriage. It hasn’t been a concrete response, rather a process that has taken time, years. 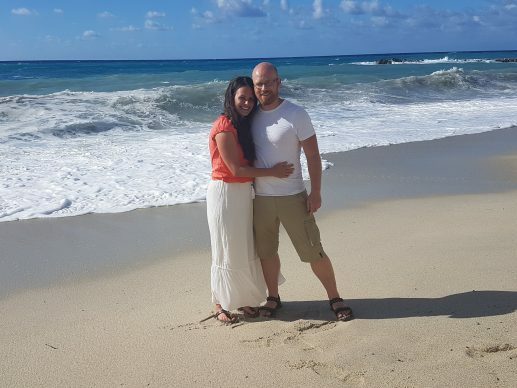 Runar has all of the qualities and characteristics that I wanted in a husband, and even more. This didn’t change after his loss of faith. So why has it been hard? I guess I have to rewind a bit to find some answers. One of my criteria for my future husband was that he had to be Mormon like me, because I wanted the same goals and guidelines for our marriage and family life. I wanted a temple marriage—to know that we were sealed for time and all eternity provided a wonderful sense of security and gratitude. I wanted to share my personal faith with the person closest to me, a person who understood where I came from and also shared my basic perspectives and beliefs—the hopes, the challenges, the ups and downs. I wanted an “ally,” being the only “weird Mormon” in school, at work, and at parties. I wanted to bring my kids to church, and to have blessings and baptisms as a matter of course. I wanted my closest person to “lift me up” spiritually when I needed it and vice versa. I had this religious framework for my marriage and family life, just what I wanted, for about six years. But I guess I took it for granted in a way. We were both quite relaxed when it came to religion, just did our normal church thing without much reflection. But then Runar over time lost his faith (this time it wasn’t just about the “God of lost car keys” but also about the particulars of Mormonism—historical and doctrinal issues). I found myself thinking of my original criteria and wants. I became aware of what I was about to lose. When I couldn’t have it, I wanted it even more. It is such a weird mental process. My response has come in waves, as I said it has been a process over many years. I guess it is still not over either. I have felt and expressed (loudly!) contrary emotions. Anger, betrayal, disappointment, grief. But I have also tried to share his pain, frustrations and disappointments. Going through a faith crisis is extremely tough—you have no idea before you have experienced it yourself. It has been and is a heavy burden to carry on a spiritual and religious practice by myself, especially when I was struggling with my own faith. Should the kids get baptized and blessed? Family scripture and prayer? Going to church and activities? What to do when the kids didn’t want to go? Priesthood blessings? Temple trips at age 12? I didn’t want to have the final say! I don’t want to do this by myself! And the anger rushes up again… But then again, on the other hand. How amazing is it that my husband gives me space and lets me carry on with the “Mormon things?” He could rightly put his foot down and said no to this or that. He is also doing his best in supporting me. He comes to church every Sunday to help out with the kids. We pray as a family and he supports every church ritual such as baby blessings and baptism. 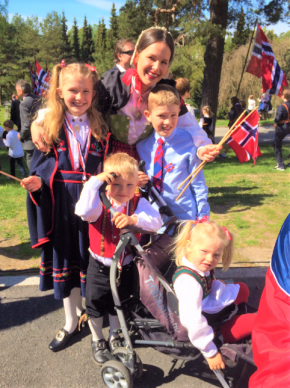 Eline and her children in traditional Norwegian clothing on their national holiday. His example reminds me of how important it is to give the spouse room to be authentic. Home should be a place where you can be just yourself with no strings attached. I need to give him the same back, let him grow in the direction that gives him peace, hope and happiness. I need to support his decisions because I trust him and love him. I don’t have to agree with everything but I have to let him be himself in order to have a good and healthy marriage. And you know what, people change after 16 years. I am working on letting these changes, both in him and myself, unite us, not separate us. It is important to find and focus on new shared goals and guidelines. Work on what we have in common, which still is almost everything. I am not married to the Church but to the most beautiful man on earth. He treats me with such love and respect. He supports me in my own faith journey, and I am doing my best in supporting his. When I look back, one of the biggest reason for my anger was that I recognized a sneaking doubt and crack in my own testimony and faith, and I didn’t want that. I felt like it was his fault— that he was “forcing” doubt to surface in me. This was of course not real. He was not trying to influence me in any direction at all. I became curious as to why he had changed his mind, how such a wise man could lose his faith in the Church that his entire family belonged to. Did that mean that I was just stupid, since I still believed? What had I not seen? Was I wearing blinders? Was it all built on a lie? 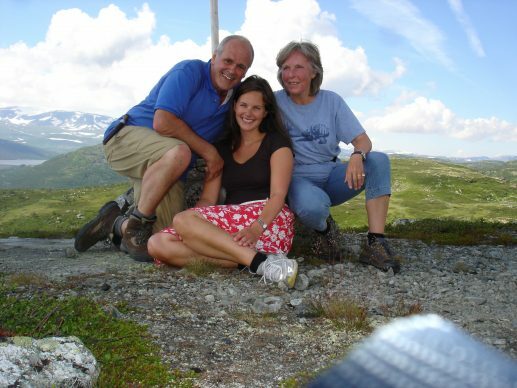 Eline hiking with her family. You remain an active member of the Church today. How have you dealt with the doubts that were awakened in you as a result of your husband’s faith transition? That is a good question and quite hard to answer. As said earlier, I grew up in the Church and it was through these glasses that I saw the world, it looked beautiful. My spiritual “shelf” was categorized and put in order. When my husband started to question, I did the same after a while. Not because he wanted me to, but I became curious as to why he had changed his views. One thing led to another and I found myself questioning and doubting everything—doctrine, policy, and culture. The shelf broke, the cracks in my “looking glass” grew and suddenly my whole world looked different. My crisis of faith was a process evolving over years. Ruminating over existential questions was the hardest thing. It affected my mood especially at home, I could become angry, frustrated and snappy over nothing which again affected my kids and husband negatively. There were periods where I was unsocial and mentally absent, I just wanted to be alone in my cave reading and trying to figure things out. I found myself crying everywhere: in the car, out running, in bed and so on. I wanted my husband to do the church stuff with the kids so that I could take a break. But since that wasn’t an option, and I wasn’t ready for the whole family to give up the Church, I stayed active. But being in church with doubts and without a believing husband was hard and stressful. All of my doubts, emotions and reactions came in waves. There were times when I was on top of the wave with everything figured out, and everything was great. But then suddenly out of nowhere came the drop, and it was just turmoil again. This was an unhealthy emotional rollercoaster for me. I hit the bottom two summers ago. I will never forget when my mom said to me with love and concern in her voice: “My dearest girl, I think you should consider resigning from Church. I see your pain and your neverending turmoil.” This conversation took place at the guesthouse by the temple. How ironic that I considered ending my membership there where everyone else walked around with goosebumps and good feelings. My mom’s word was a heads-up and a warning for me. I had to do something. I had dealt with my doubts for enough years and I was so tired of the waves knocking me down. Your mother is a believing member of the Church. What did you decide to do after she, out of compassion for your continuing pain, suggested you separate yourself from the Church? Well, there is a long story of what I did leading up to my mother’s suggestion. I think maybe it’s necessary to tell you about that first to get the whole picture. I have told you that my doubts started some years into my husband’s faith transition. A dark wave was over me for a long time. I decided to do some things before closing the door— to double down on my effort. This is what I did, the short version. I prayed. I fasted, although it was hard for a food lover like me. I had conversations (and discussions with me yelling and screaming!) with those near and dear to me, especially my mother. They listened, respected me and never wanted to change me. I read blogs and listened to podcasts. I read the Bible and the Book of Mormon. I have a slightly ambivalent relationship to the scriptures. On the one hand, they basically work like sleeping pills for me. The antiquated language simply puts me to sleep. In addition, there are things I find provoking or that I simply don’t understand. But at the same time, there are many beautiful scriptures that have touched to my heart, that have strengthened my faith, and warned me. Those scriptures keep me reading. I listened to the prophet and the apostles at General Conference. I attended church and tried to follow what I was learning there. Sometimes things are said that I don’t necessarily agree with, but I do what makes sense to me and feel at peace. I try to live what I learn. After a while, I finally began to “figure out” my issues. So I said yes when asked to give a talk in sacrament meeting based on President Monson’s conference address, “I Will Not Fail Thee, Nor Forsake Thee.” Reading the talk for the first time touched me deeply. I felt it was written to me and sort of like an answer to my prayers. I decided to open up to my ward, my “church family,” about my struggles with doubts. I also bore a sincere and strong testimony. I will never forget the feeling afterwards. I was so happy, uplifted, and at total peace. I got beautiful feedback from my ward and family that surprised me and touched me deeply. Shortly after the talk, I wanted to do something that “manifested” my newfound faith. I bought a painting that reminded me of what I had been through and who I wanted to be. I also got another thought: maybe I should start a blog where I share my faith and women’s stories! But this idea was totally crazy! I don’t like to write, I don’t have confidence in my grammar and linguistic skills. I don’t like to be different. (The Mormon Church is really small here.) I don’t like to broadcast my personal faith for everyone to laugh at and be put in a tiny box for weird crazy people! But I couldn’t get rid of this thought and I had something that I wanted to share. So one day—the blog was online and I became a public Mormon girl! That was scary, oh my gosh! I remember shaking and sweating in my hands while connecting the blog to facebook for all of my friends to see. I still can’t believe I did it! Hundreds of people read the blogpost where I shared my own faith story. It was also published at the local pages in Liahona and on the church website in Norway. I got emails and texts from unknown people thanking me for sharing. I was thrilled. I was authentic and it felt good. I was happy, firm and stable in my faith the following year. Then the dark wave hit me again. 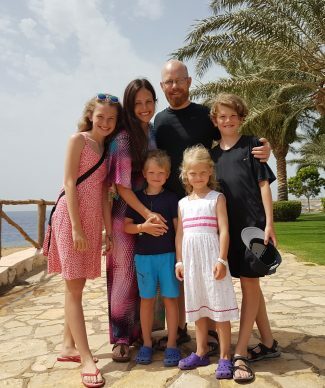 My son was turning eight years old—the age of baptism. Did I want him to be baptized? I talked to my husband about it and he said it was up to me and of course our son. The birthday came and went. I postponed the decision up until my mother asked me about it. I had to decide and I knew deep down what the problem was. Would I get baptized if I were investigating the Church? I couldn’t answer that question and it made me really frustrated. I stopped writing and got a nasty feeling of regretting the crazy blog project. I felt like a hypocrite. I felt stupid, fake, and trapped. Combined with other stressful things happening in my family at the same time, I was screaming for some alone time. I was exhausted physically and mentally and needed to get away. So I went to our cabin at the mountains when fall came. I planned to stay for three days eating good food, reading magazines, and watch series on Netflix. But my biggest goal was to be able to answer my own faith-related questions. That was in my head. It ended up with me going “underground” in total silence for five days with no “entertainment.” I went on long hikes, prayed, read the scriptures while taking notes, fasted, wrote in my diary, stared out the window, read a book related to my issues, listened to General Conference. I can’t believe I did all of this alone for five days! Besides hiking, I normally find these activities really boring. But now, I found myself intensely occupied, I was thrilled and energized. I had absolutely no interest in Netflix, Facebook, or phone calls! I was planning a seven hour hike the last day at the cabin. I wanted to give it “my last shot,” so I decided to fast the whole day. I picked up the scriptures before I went out, almost “rolling my eyes” thinking it was such a cliché. But I opened the book and my eyes fell upon these sentences from Mosiah 24:14 “And I will also ease the burdens which are put upon your shoulders, that even you cannot feel them upon your backbones.” The words meant a lot to me and pierced my heart. I came home from the hike with a big smile on my face. It was an amazing experience. The power of the beautiful nature overwhelmed me. New thoughts came to me at a rate and in a way that I had never before experienced. I want to think it came from God. My soul was filled with light and love. I went home from the mountains and my son got baptized. I felt good about the decision and it was a beautiful day. I didn’t pick up the blog though—I wasn’t there quite yet. After the experiences during my “silent mountain week,” I really thought the “dark wave” would never hit me again. I was sadly wrong. The Church came up with a new policy that I didn’t agree with. (The November 2015 policy stating that children of gay parents can’t be baptized before age 18.) What do you do when you think something is just terribly wrong? I was angry and couldn’t stand by the decision. I talked to my bishop, husband and parents. I couldn’t deny my testimony and previous experiences. But I didn’t know how to reconcile my conflicted thoughts. I wanted to be authentic but didn’t know how. And struggling with one thing caused everything else that had been hard for me also to rise to the surface. The summer came, and I decided to go to the temple. Being there without my husband is emotionally hard. But I had felt such peace there before, and I needed that in my life. I needed answers, even though I wasn’t sure temple attendance could give it to me. There were so many practical challenges to get there this time, but I arrived safely late at midnight summer 2016. Before I answer your question, it is important to me to explain my relationship with my mother. My mom means everything to me. She has been the one I have talked to the most during my struggles. She took all of my concerns seriously without condemning me. She has shared my burden and wept with me when I need it, or given me advice and mental pushback when I needed that. I knew I couldn’t shake her testimony so I just poured my heart out—the good, bad and ugly. When she said what she did, it was coming from love. Maybe it is weird, but I felt like I was set free in away. The last thing on earth I ever wanted to do was to hurt her feelings or make it weird between us. But now I had her blessing to leave and I knew nothing could break our love and respect for each other. I was surprised, what did I just read? I reread it over and over again, I was at peace and the tears came. Was it a coincidence or was God aware of me? Was it me trying to simulate an “imaginary spiritual moment out of my desperation?” I was confused and didn’t have any answers to that, but I had a smile on my face. I went back to Norway but the words from the scripture had pierced my heart and stuck with me for a long time. The continuing feeling of God’s existence in my life made me happy. I decided to stay and see where it led me. I resumed my “activities to do before I close the door” (but no long hiking in the mountains this time!). Six months went by and I still felt calm and happy without any “faith meltdowns.” One day a thought came to my mind: You must start to write again. I hadn’t written anything on the blog for about a year, because I didn’t feel comfortable in my own “Mormon skin.” However, the feeling was strong, and I couldn’t think about anything else. So, I turned on the computer and started to write. Now I look back and realize that writing helps me think and process. I often feel that the words are coming to me, and let me see issues from a different perspective. I don’t publish everything I write, some is just for me. The women I write about teach me and inspire me. It is interesting to learn how the gospel has had an impact in their lives. Their stories remind me that the gospel has so many angles and perspectives. I find that rich and empowering. 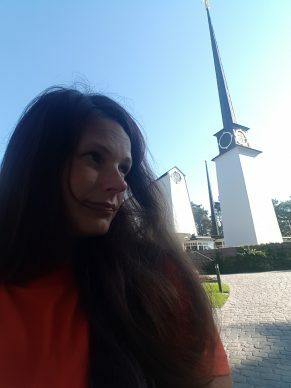 So, to sum up what I did during my years of faith crisis when that dark wave was over me and I considered resigning: I went to the temple, church, conferences, woods, and mountains. I took part in ordinances, meditated, fasted, and prayed. I started to write and created a blog while at the same time diving into reading everything—books, blogs, discussions in my private Facebook groups, scriptures, and conference talks. I used my mouth to talk about my issues with trusted people, and ears to listen and ponder. Eline by the Stockholm Temple. Who are some of the women whose stories have supported you in your faith? What does “living the Gospel” look like in your home, with your husband and children? Christ is at the forefront of my mind when I think of “living the Gospel.” My husband is my greatest example and reminder on how to follow in His footsteps: show love to everybody, especially your family; honor your parents; take care of the sick, poor, old, and needy; put others before yourself; work hard; be honest and kind; be a friend; be thankful, happy, and cheerful. This is what I hope my home will look like. Working on that! I take responsibility for reading the scriptures to the kids, for family prayer and for bringing them to church activities. These are the biggest challenges for me. I have my husband’s support, but it is on my shoulders and feels heavy sometimes. I am looking back at my faith journey with smiles and tears. There have been so many tears! Religion can truly be messy! But at the same time, I am not the same person I was. Maybe a cliché, but it is how I feel. I am more confident in myself, and my voice. I have had some experiences during these years that have led me to feel God’s presence in my life. Nothing spectacular, but enough for me to know that I have been lifted, taught and loved. I have had to look at my church and God in light of what bothers me. There are still things that I question, do not agree with or wish were different about Mormonism. My looking glasses have slightly different lenses now, and that is fine. I live with my doubts and I am at peace with that. I have gained a more universalist faith. I believe that God helps all His children, whether we want Him to or not, whether we acknowledge Him or not. I believe God is present in my husband’s life and has a plan for him. He wants all of us, but we have different journeys to travel. As long as we are true to ourselves and the light and truth we have received, I think God is satisfied.